The fingers are powerful and calloused from decades repairing huge tanker trucks that must transport 10,000 gallons of fuel throughout the west. The Hawaiian born Tom (Masaru) Yonamine, a lead mechanic for Union 76, is probably the world’s only amateur ukulele player who refers to his $1,200 Miller uke as “my Stradivarius.” He’s referring to violin virtuoso Itzhak Perlman’s multi-million dollar centuries-old Soil Stradivarius of 1714 hand-crafted Italian violin he calls his “fiddle.” Yet Perlman, who for years has been playing his “fiddle” before SRO audiences throughout the world, and Tom who plays before what he describes as a “Sitting Room Only” audience of one — his Japanese American wife, Sharon. Yet, Tom and the famed violinist have three things in common: They are both 70, cherish their string instruments and perform concerts: Perlman at places like Carnegie Hall and The White House; Tom, before his wife, adult kids and grandchildren at their home in Gardena, Calif. “For years he’s been playing that uke,” says his wife. “Seldom misses a day. It’s like watching John Wayne parading around the house picking and strumming.” Sharon, he claims “is my only severe critic. If I’m playing too loud, she lets me know. If Mr. Perlman ever played at our house, he’d get a standing ovation. I’m still waiting for mine!” Tom’s favorite musician is Japanese born Jake Shimabukuro. “Jake is to ukulele what Mr. Perlman is to violin: A super star. They both play classical, jazz and pops to sold-out crowds everywhere.” Tom does perform with a ukulele group in Torrance known as Kanakapla. “For me,” he admits, “learning chords is tougher than replacing a truck transmission.” What has he learned from fiddling with a uke? “The ukulele is growing in popularity. It’s a social instrument that brings people together. Even for a musician like Jake Shimabukuro, it’s fun to play and the challenge never ends.” Despite his linebacker physique, says his wife of 50 years, “my husband is a romanticist. The song he plays most is Chotto Matte Kudasai, a Japanese love song. Translated into English it means: ‘Wait a Little While. 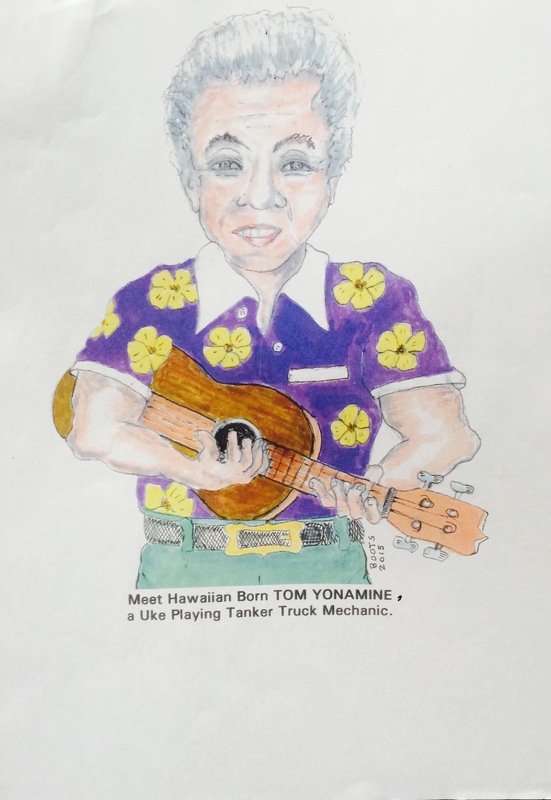 '” So playing the uke turns the retired tanker-truck surgeon into a Romeo and teaches him the art of patience. The troubled world could use both of those virtues today.